Pros: Inexpensive, relatively reliable. Works well with video cameras. Cons: Pentax K-7 requires Class 6 cards to write full-resolution movies. However, with this card it terminates recording after approx. 35 seconds since beginning - the buffer is full. I've got this result with firmware 1.03. Pros: Matches my eeepc 900a Read 17MB/s - 20MB/s Write 7MB/s - 9MB/s well within specs for Class 6. Currently using SUPER TALENT FPM16GRSE Mini PCIe 16GB Mini PCIe (SATA) MLC Internal Solid State Drive (SSD) For a hard drive. Pros: Write speeds with HD Tune were 15MBps average, 14MBps minimum, much faster than the Class 6 specs minimum. 16 GB allows for ~4900 8MP superfine pictures or 210 minutes of 640x480 video on my Canon A590is. Cons: This replaces my 8GB A-Data card which died in under a year. Lets hope that was a fluke, lost some great photos. Other Thoughts: Not sure why others have had issues with speed, but I certainly didn't. I just hope I don't end up with card errors again. So far so good. No speed bursts on write. 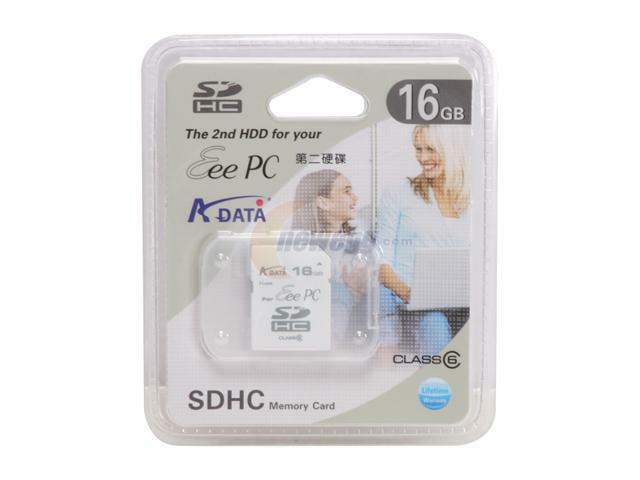 Other Thoughts: Was the cheapes 16GB SDHC card when I purchased it. Pros: It was fast while it lasted. Cons: It only lasted a few months. Now all I get is errors reading and "Windows was unable to complete the format." Pros: Cheap flash memory that works 99+% of the time. Cons: I took 6000 pictures on a recent trip to Africa and 13 of them were corrupted when I got back. These were ~9MB Nikon d80 RAW shots. I've taken ~100 thousand shots on various other flash cards and never had this problem before. I'm generally very careful with my things. Obviously, these didn't just stay in my camera the whole time, and my best guess is that they flexed slightly in my camera bag and lost these images, but again, I've never had that happen before. Cons: Not the speed I expected.